Experience Points is a series in which I highlight some of the most memorable things about a particular game. These can include anything from a specific scene or moment, a character, a weapon or item, a level or location, a part of the soundtrack, a gameplay mechanic, a line of dialogue, or anything else about the game that is particularly noteworthy and/or awesome. This series will no doubt contain spoilers for the games being discussed, so keep that in mind if you plan on playing the game for the first time. With a newly announced 3DS version on the horizon, this entry will be all about Dragon Quest VIII. Feel free to share some of your own favorite things about the game in the comments! Yangus... how do I describe this man? He's sort of the comic relief character, he has a weird name, his background is rather shady, he wears some kind of odd spiky fruit husk on his head, he has an annoying catchphrase, he's short, fat, hairy, brutish, and overall conventionally unattractive. And yet I love him so much! 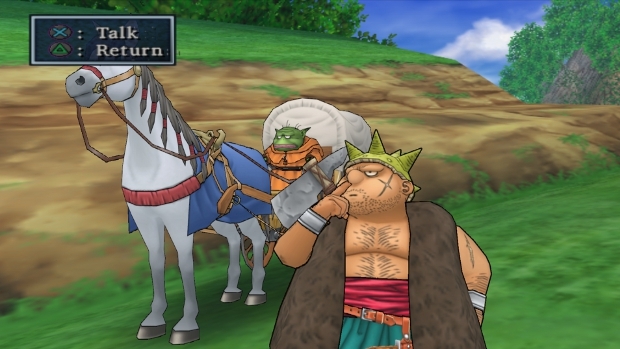 Dragon Quest VIII lets the player choose which party member they want to walk around as, so as soon as I figured this out, I obviously picked the big, lovable oaf. I never played as anyone else. I mean, how often do I get to be a chubby hairy dude in a videogame? Not nearly often enough. Yangus' comic relief even manages to make its way onto the battlefield. If he pumps up his Humanity stat, he'll gain some pretty hilarious moves. One such move, Golden Oldies, has Yangus shouting "Grandad!" and calling forth King Trode and a mob of rowdy old men to rush the enemy for lots of damage. And then there's the Underpants Dance, which unfortunately does not involve Yangus dancing around in nothing but his underpants, but rather dancing around while waving two pairs of boxers about in an attempt to shock enemies. They're not the most useful of moves, but I still used them at just about every opportunity, simply because they made me smile. I mean, what's not to love about an underwear attack? Yangus actually got his own spinoff game, Dragon Quest: Young Yangus and the Mystery Dungeon, but of course it was only ever released in Japan (boo!). I'm glad he was apparently popular enough to warrant a game of his own, though! 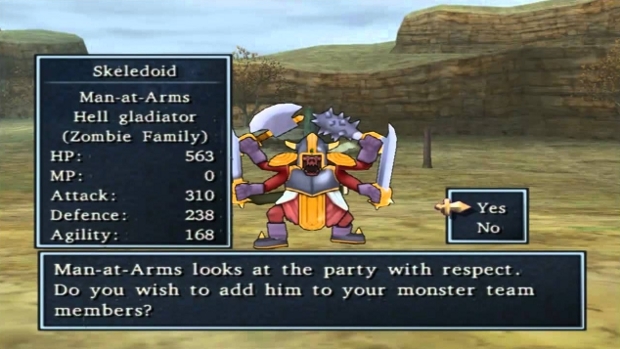 Outside of the main quest, the best part about Dragon Quest VIII is the ability to recruit monsters from the field and form monster teams. These teams are primarily used for the monster arena sidequest, but they can also be sent out during normal battles to help the party fight at any time in the game. I've always loved the monster designs in the Dragon Quest series, so being able to recruit some of them for my own team was really appealing to me. All of my favorites, including the King Slime, Cyclops, Golem, Hoodlum, Orc King, Jargon, Jumping Jackal, and so many others are able to be recruited. I usually had one team full of monsters that I liked, regardless of how powerful they were, and one team comprised of monsters built to win battles. Depending on which monsters are placed on a team together, they might even be able to earn special bonuses or abilities. For example, a team composed entirely of slimes will get double the amount of hit points. My personal favorite team is called My Three Golems. A team of three golems will be granted a special ability which allows them to fuse together, creating a super powerful mega golem named Mazin with 999 HP and all-around impressive stats. So not only are the golems one of my favorite enemy designs, but they're incredibly useful in combat as well! There's nothing more satisfying in Dragon Quest VIII than landing a killing blow on a Metal Slime. Not only are the metallic gelatinous blobs incredibly difficult to defeat, but they yield a crazy amount of experience points, so hunting them down is definitely worth it. These guys come in three variations: Metal Slime, Liquid Metal Slime, and Metal King Slime. 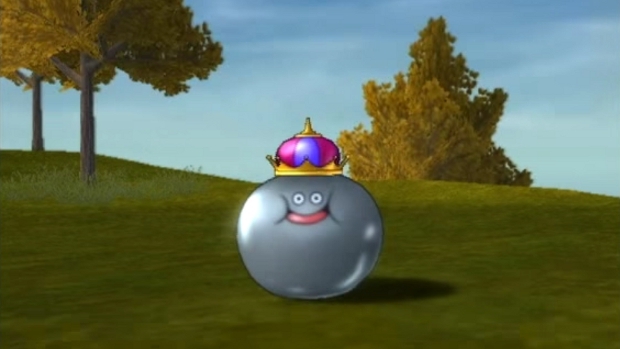 Obviously, the Metal King Slimes are the rarest and most sought after of the slimes. These lustrous foes are so difficult for several reasons. For one, they have ridiculous defenses; most attacks will only deal a single point of damage or nothing at all, barely causing more than a scratch. They also have an extremely annoying tendency to run away from battle as soon as possible, meaning players have to rush to destroy them as quickly as they can before the slimes are able to slip away. Not to mention the Metal Slimes are rare enough that even seeing one usually causes my heart to skip a beat, only for my hopes to be swiftly dashed as the slime runs away in the first turn. Players need to have a solid strategy and plenty of luck in order to take them down. It takes a lot of patience, but it's worth it. The first time I defeated a Metal Slime was one of the best feelings ever! In just about any JRPG, you can expect to fall victim to status effects. JRPG veterans are always prepared to be poisoned, paralyzed, burned, confused, and put to sleep. But what about becoming so obsessed with dancing that you can no longer focus on fighting? In Dragon Quest VIII, they got a little creative with the status effects by adding in a few silly ones, including an effect known as the dancing bug. Certain enemies will occasionally break into a dance so infectious that the team of brave warriors just can't help but join. Characters who catch the dancing bug will be unable to act for a turn, since they'll be too busy busting a groove. The penalty of the effect is nothing special, just a missed turn, but it was so unexpected that it immediately became my favorite thing. Sometimes I'd just sit there and allow dancing enemies to attack me, just so I could watch each of my characters let loose and have some fun. It almost feels like more of a reward than a penalty. Who cares about a missed turn when it means I get to watch Yangus prancing around? There's a running joke in the Dragon Quest series known as "Puff-Puff." 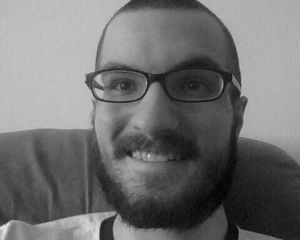 It's a pervy joke based on the idea of rubbing one's face between a woman's breasts. Usually not my thing, but I have to admit that the secret Club Puff-Puff room in Dragon Quest VIII definitely made me laugh. It was actually the first time I had encountered the term before, so when I found the room I didn't quite know what to expect. A burly muscleman greeted Yangus at the counter and invited him into an adjacent room where a girl in a bunny outfit beckoned him into a chair and offered to give him a "Puff-Puff." I accepted out of curiosity. When the lights came back on, Yangus was sitting there with a blindfold on as the woman was rubbing two slimes on either side of his face. Blissfully unaware Yangus looked like he was having the time of his life, and I couldn't help but laugh at the unexpected turn of events. As a gay man, it reminded me of that scene in The Emperor's New Groove where Yzma pulls up her skirt and everyone starts cringing until they realize she's just revealing a hidden knife. "Whew, ohh okay!" Of all the fantastical locations and creepy dungeons in Dragon Quest VIII, there's one area that always stood out in my mind as being particularly interesting. In the final dungeon, the Black Citadel, there's a certain room shaped like a huge circle. 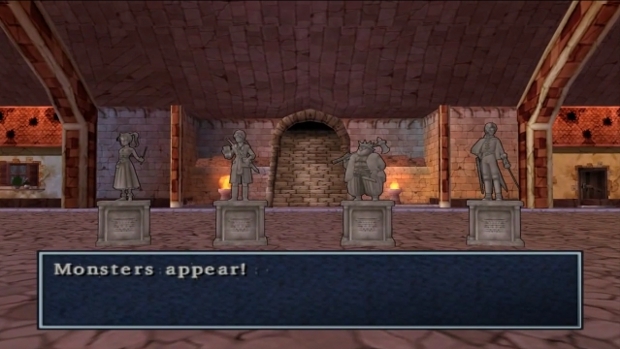 The party enters from a hallway off to the side, eerily decorated with four statues of the party members themselves, and loops around the circle. But strangely, it just brings them right back around to the entrance. The first time I encountered this room, I was very confused. I ended up backtracking around the circle again thinking I had missed something. There's this huge circular room, with lots of windows and doors lining the exterior, but nothing to find there? No new paths or anything to interact with? I kept wandering around, thinking I had surely just missed some small thing, when I suddenly noticed the room had changed. As I was looping around, the windows and doors I had passed several times before had become mysteriously boarded up, and the ground was all cracked with pools of poisonous-looking water seeping in. What's going on? I looped back around to the entrance again, only to find that the entrance had disappeared! And even more unsettling, the statues of my party members had all been beheaded! Was I trapped and doomed in this creepy eternal hallway? Since there was nothing else I could do, I made another loop and the hallway started to change again. The walls lined with windows and doors began to disappear, only to be replaced by dungeon cells full of skeletons. Finally, an exit opened up across from where the entrance had been, although the beheaded statues were now completely decimated. Talk about creepy, but at least I was finally out of that place! Later on, when exiting the castle, I had to run back through the scary endless hallway (nooo!). The room slowly began to reform back to its original state, and the statues rematerialized. And then, right when I tried to leave through the entrance, the statues attacked me! Of course the creepy self-mutilating statues would come to life. To be honest, this area is kind of a chore to navigate, having to run through this long hallway until the entrance and exit appear, but the atmosphere of the place really left an impression on me. I was genuinely on edge the entire time, thinking something awful was about to happen. When did the survival horror genre creep its way into my light-hearted JRPG? I certainly didn't expect it, but I also kinda liked it!